While in Shanghai in 1925 Wallis Spencer had an affair with the handsome fascist, Count Galeazzo Ciano, who was later to become the son-in-law of Benito Mussolini. The affair resulted in a pregnancy, and a carelessly carried out abortion had left Wallis unable to have any more children. Wallis eventually divorced her husband in 1927. Wallis then met the divorced businessman, Ernest Simpson. The couple married in 1928 and moved to London. They became friends with Lady Thelma Furness, a mistress of the Prince of Wales. On the 10th January, 1931, Furness invited them to her country house at Melton Mowbray where they met the heir to the throne. Prince Edward was fascinated by Wallis and it was not long before he was having an affair with her. Colin Matthew has pointed out: "By 1934 the prince had cast aside both Lady Furness and Freda Dudley Ward (the latter cut off without, apparently, any personal farewell). The prince saw Mrs Simpson as his natural companion in life, both sexually and intellectually.... A man accustomed to get his way, when he knew what it was that he wanted, the prince of Wales seems to have thought from 1934 onwards that matters would turn out as he wished. Though he appears from an early stage to have wanted Wallis as his queen, he made no effort to test or prepare the ground, even with those whose support would be vital. Nor do those around him seem to have sounded him as to his intentions (and as his accession was clearly imminent they could not have been blamed if they had done so). Neither the prince's father nor mother seems to have raised with him either the affair or its likely result. Thus the prince of Wales's affair with Mrs Simpson, pursued with a passion evident to all who observed it, occurred in a political and constitutional limbo." 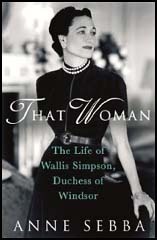 Wallis Simpson left her husband and went to live in an apartment in Bryanston Court. Also living in the building was Princess Stephanie von Hohenlohe, a Nazi spy being monitored by British intelligence. The two women soon became close friends. This was unfortunate for Simpson because of a tip off from French Intelligence, MI6 was intercepting Princess Stephanie's correspondence and tracking her movements in and out of the country since early in 1928. Edward's relationship with Simpson created a great deal of scandal. So also did his political views. In July 1933 Robert Vansittart, a diplomat, recounted in his diary that at a party where there was much discussion about the implications of Hitler's rise to power. "The Prince of Wales was quite pro-Hitler and said it was no business of ours to interfere in Germany's internal affrairs either re- the Jews or anyone else, and added that dictators are very popular these days and we might want one in England." In 1934 he made comments suggesting he supported the British Union of Fascists. According to a Metropolitan Police Special Branch report he had met Oswald Mosley for the first time at the home of Lady Maud Cunard in January 1935. The government was also aware that Wallis Simpson was in fact involved in other sexual relationships. This included a married car mechanic and salesman called Guy Trundle and Edward Fitzgerald, Duke of Leinster. More importantly, they had evidence that Wallis Simpson was having a relationship with Joachim von Ribbentrop, the German Ambassador to Britain. The FBI definitely believed this was the case and one report suggested that he had sent a bouquet of seventeen red roses to Princess Stephanie's flat in Bryanston Court because each bloom represented an occasion they had slept together. Chips Channon also believed the couple were having an affair. He recorded in his diary: "Much gossip about the Prince of Wales' alleged Nazi leanings; he is alleged to have been influenced by Emerald Cunard (who is rather eprise with Herr Ribbentrop) through Wallis Simpson." MI5 were also concerned by Simpson's relationship with Ribbentrop and was now keeping her under surveillance. Paul Schwarz, a member of the German Foreign Office staff in the 1930s, claimed in his book, This Man Ribbentrop: His Life and Times (1943), that secrets from the British government dispatch boxes were being widely circulated in Berlin and it was believed that Simpson was the source. George V died on 20th January, 1936. The former Prince of Wales now became now became Edward VIII. It was not long before the king's relationship with Wallis Simpson was being reported in the foreign press. The government instructed the British press not to refer to the relationship. The prime minister, Stanley Baldwin, urged the king to consider the constitutional problems of marrying a divorced woman. Although the king received the political support from Winston Churchill and Lord Beaverbrook, he was aware that his decision to marry Wallis Simpson would be unpopular with the British public. Cosmo Gordon Lang, the Archbishop of Canterbury also made it clear he was strongly opposed to the king's relationship. King Edward VIII did receive support from Oswald Mosley. He attacked those criticised his relationship with Mrs. Simpson: "He who insults the British Crown thus insults the history and achievements of the British race... The King has been loyal and true to him." Mosley went on to state that the king deserved, after many years' faithful service as Prince of Wales, the right to live in private happiness with the woman he loved." Princess Stephanie von Hohenlohe then became involved in the controversy. According to Jim Wilson, the author of Nazi Princess: Hitler, Lord Rothermere and Princess Stephanie Von Hohenlohe (2011): "Princess Stephanie, still seeking to fulfil Hitler's wish, was the person who originally floated the concept of a morganatic marriage as a solution to the king's dilemma. She, like the diplomats in the German Embassy, was desperate to find a means of keeping Edward and Wallis in power in Buckingham Palace. The device of a morganatic marriage, she explained, would have allowed Edward to marry Mrs Simpson, but on the condition that she would merely be his consort and would not take the title Queen of England. It was very much in Hitler's interests that a way should be found out of the constitutional maze which threatened to force Edward off the throne." Robert Vansittart, Permanent Under-Secretary at the Foreign Office, had received information that Wallis Simpson was passing information to the German government, and conveyed his fears to Prime Minister Stanley Baldwin. Foreign Secretary Anthony Eden decided to restrict information shown to the King. The authors of Baldwin (1969) have pointed out: "Mrs. Simpson... was under close scrutiny by Sir Robert Vansittart and both she and the King would not have been pleased to realise that the Security Services were keeping a watching brief on her and some of her friends. The Red boxes sent down to Fort Belvedere were carefully screened by the Foreign Office to ensure that nothing highly secret should go astray. Behind the public facade, behind the King's popularity, the Government had awakened to a danger that had nothing to do with any question of marriage." The FBI continued to keep Wallis Simpson under surveillance and in one report to President Franklin D. Roosevelt he stated: "It has been ascertained that for some time the British Government has known that the Duchess of Windsor was exceedingly pro-German in her sympathies and connections, and there is a strong reason to believe that this is the reason why she was considered so obnoxious to the British Government that they refused to permit Edward to marry her and maintain the throne... 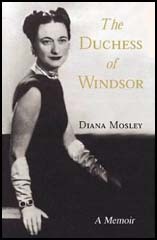 Both she and the Duke of Windsor have been repeatedly warned by representatives of the British Government that in the interest of the morale of the British people, they should be exceedingly circumspect in their dealings with the representatives of the German Government." On 20th October, 1936, Stanley Baldwin met King Edward VIII at the king's country house, Fort Belvedere. The King once again stated his intention to marry Wallis Simpson. Baldwin replied that if this happened he would be forced to resign as Prime Minister. Mrs Simpson's biographer, Philip Ziegler, has argued: Once Mrs Simpson realized that marriage to her would cost the king his throne, she tried to change his resolve. Anticipating much hostile publicity when the story broke in the United Kingdom, she retreated first to Fort Belvedere, and then to the south of France. From there, in a series of distraught telephone calls, she tried to persuade Edward not to abdicate, even if this meant giving her up. She accomplished nothing; this was the only subject on which she was unable to dominate her future husband." In a debate on the constitutional crisis in the House of Commons, the Communist Party MP, William Gallacher, commented: "The King and Mrs Simpson do not live in a vacuum. Sinister processes are continually at work... The Prime Minister told us he was approached about a morganatic marriage... but he did not tell us who approached him.... It is obvious that forces were encouraging... what was going on... I want to draw your attention to the fact that Mrs Simpson has a social set, and every member of the cabinet knows that the social set of Mrs Simpson is closely identified with a certain foreign government and the ambassador of that foreign government." On 10th December, 1936, the king signed a document that stated he he had renounced "the throne for myself and my descendants." The following day he made a radio broadcast where he told the nation that he had abdicated because he found he could not "discharge the duties of king as I would wish to do without the help and support of the woman I love." On the night of his abdication, 500 Blackshirts shouting support and giving the Fascist salute gathered outside Buckingham Palace chanting, "We Want Edward". The following day, Oswald Mosley demanded the question of the abdication be put to the British people in a referendum. Unity Mitford, Hitler's friend and admirer who had just returned from Berlin, apparently said: "Hitler will be dreadfully upset about this. He wanted Edward to stay on the throne." In Nazi Germany, Hitler's express instructions, Joseph Goebbels ordered the media to make no mention of the constitutional crisis raging in Britain. Goebbels was also furious with the way that Edward had handled the matter. In his diary he wrote: "He (Edward) has made a complete fool of himself. What's more it was lacking in dignity and taste. It was not the way to do it. Especially if one is king."